I have been searching around for Octoban samples.. The few I have found have been sub par. So I have decided to create my own.. The plan is to build one Octoban.. The biggest one. Record it then cut the octoban down and record again. Do it until I get a full set of samples. 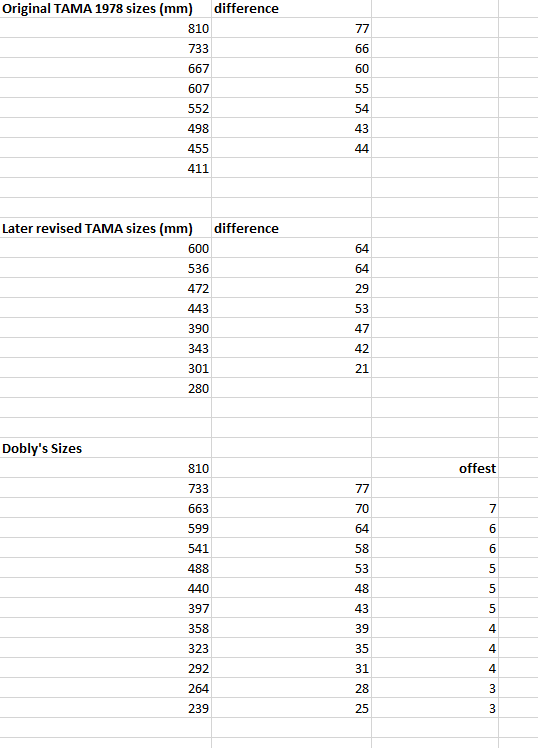 I looked on the wiki page and found the sizes of the original TAMA octobans from 1978. They later changed the sizes as they were deemed to be too big. I want to build the biggest one from 1978 down the the smallest one today. Around 12 different sizes. If I am going to do this I may as well go all out. In the image below you can see the sizes of the 1978 set, the later set and at the bottom the sizes i am going to make. Looking as the values to the right you can see the differnce between the sizes.. There does not seem to be any rhyme or reason to the pattern. So I figured it is just a free for all.. As long as they are close you can tune the head up or down..
At the bottom you can see the range of sizes I am planning. All 13 (might even to 14) of them. You can see i have evened out the offset between different sizes.. If any of you have better maths or knowhow than me, feel free to suggest alternate sizes.. Since my last post I found out that Octobans are usually tuned to a certain musical scale. C#. I found online a new set of sizes along with what note they are tuned too.. That set had only 8 sizes that range from around 279 to 615 mm (25 inches to 11 inches). I don't want go smaller than 11 inches and I want more than 8 sizes. So I worked the numbers to create the 8 bigger sizes from the ones provided. This is what I came up with. 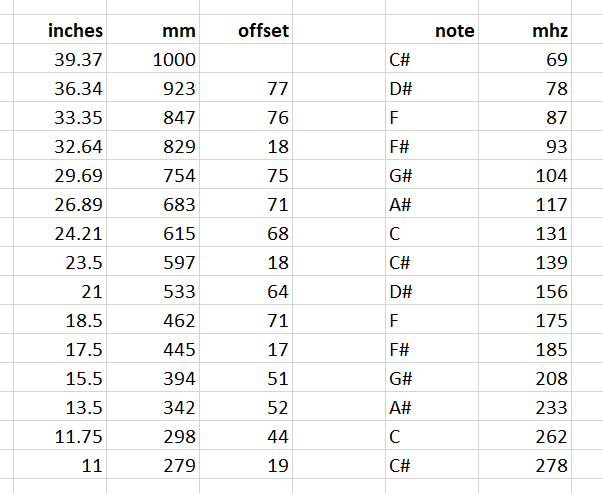 It may not be exact, but I will have some leeway to tune each size up or down a little to get the right note. As 6 inches is 152mm, I went down the Bunnings (huge hardware store in Aus) to get a length of 150mm PVC pipe. Good thing I took the 6" drum head with me. The 6" on the head is the width of the entire head. Rim and all. I could not put the head over a 150mm pipe. Looking at it I think 140mm would more like it. 150mm pipe is a common plumbing size here. 140mm is not. Not sure were I am going to get the shell for this Octoban. I'm open to ideas. After much trial and error and guesswork I have finalized the sizes I am going to use.. The number in the green box can be tweaked to effect the final length over on the left. 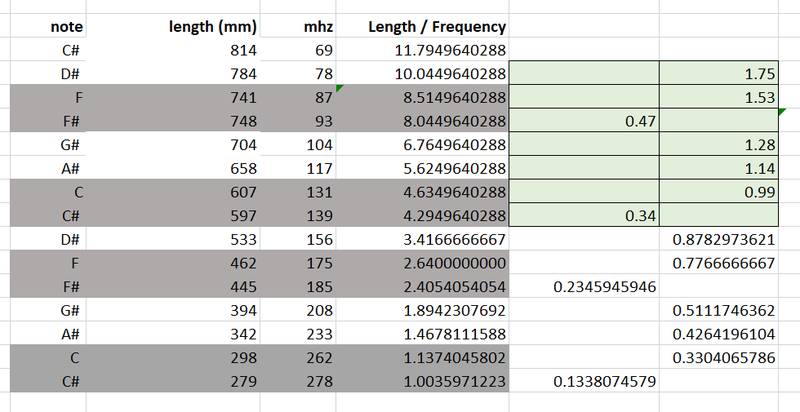 The graph shows length / Hz (I have mhz in the title in Excel). The graph is straight enough for rock and roll.